It’s a bit of a delay, but here’s another important review of Ebbe Klitgård’s Chaucer in Denmark, written by University of Iceland’s Chaucerian, Sif Rikhardsdottir, for The Medieval Review. Left: Papal visit swag currently on sale at George Washington University. 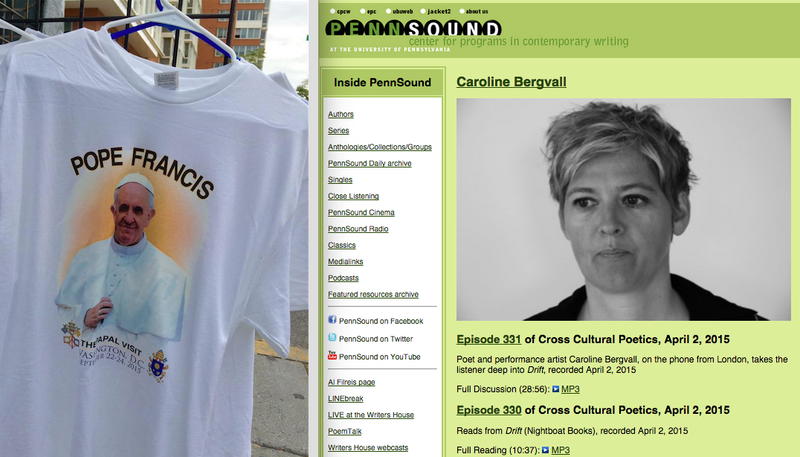 Right: Screenshot of Caroline Bergvall’s recordings at PennSound (September 24, 2015). As I sit in my office this morning writing this blog post, the Pope is addressing a joint session of the US Congress on the other side of town (follow the live-streaming of the speech here). After concluding this visit, the Pope will continue on a busy itinerary through Philadelphia and New York. To mark this occasion, check out Caroline Bergvall’s Chaucerian/BBC mashup about a previous (2006) papal visit: “The Summer Tale (Deus Hic, 1).” Both the text and a voice recording can be accessed at PennSound. A blog posting about medievalist responses to the global refugee crisis, with a nod to Chaucer pedagogy (with a passing reference to Bergvall’s work Drift, which evocatively refracts the current refugee crisis by way of the Old English poem The Seafarer). In The Middle is promoting a special discount for two important books on medievalism (recently published by Boydell & Brewer)! take advantage of verse or prose forms (or other stylistic conventions) available in the receiving literary culture but not in English. We’re super excited about the international panel, with its mix of translators and scholars! View from the moderator’s table. “Trans-Medievalisms” session at BABEL in UCSB, October 2014. What happens to the Western Middle Ages when it crosses into diverse, concurrent times, languages, and cultures? How does “medievalism” take shape in multiple spaces across the planet—including cultural habitats where the Western Middle Ages are no longer the “‘zero point’ of orientation” (to reroute a phrase from Sara Ahmed’s Queer Phenomenology)? What cultural work do “the Middle Ages” perform as they infuse modern-day modes of global media and cultural production—textual, visual, musical, performative, cinematic? Our session is inspired by our work on the Global Chaucers project, a utopian scholarly endeavor that seeks to gather, back-translate, and analyze all non-English translations and adaptations of Chaucer’s work. 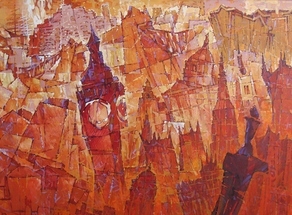 Our scheming with scholars around the world has so far revealed Chaucerian adaptations in places as far-flung and interconnected as Latin America (Argentina, Bolivia), East Asia (China, Japan, Korea), Europe (Denmark, Flanders, Spain, Hungary), the Middle East (Israel, Iran), and Africa (Nigeria, South Africa), as well as works in re/invented languages (Esperanto, Neo-Latin). For this session we aim to gather participants working on Chaucerian adaptation in non-English contexts or any aspect of medieval appropriation in “global” contemporary culture (however conceived). How might plurilingual, transoceanic, and intercultural orientations provoke new modes of engaging with the past? How can we create a dynamic, multi-site community of cross-temporal scholars and enthusiasts, a fluid collective that thrives across disciplines and borders? We welcome non-medievalists, amateurs, and enthusiasts, including creative work by poets, playwrights, musicians, and/or interpretive dancers. We highly encourage collaborative submissions. The session at UCSB resulted in four strikingly divergent yet enticingly intertwining presentations. 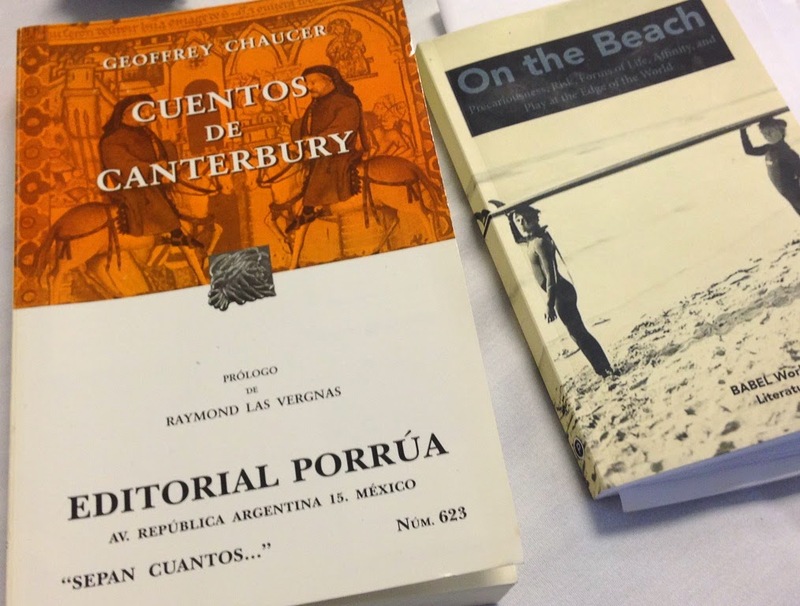 Raúl Ariza-Barile: Chaucer’s Spanish Accent: Impossible Poetry? Raúl’s paper offered a brief background of Chaucerian translation into Spanish, suggesting (among other things) how a careful consideration of Latin American contexts might shift our conversations about the aims and practices of modern translators; the presentation ended with a debut performance of his own translation of the opening lines of Chaucer’s General Prologue into rhymed Spanish verse. Shyama Rajendran: The Impossibility of Locating The Ramayana. Shyama’s presentation traced the movement of the ancient epic Ramayana across many cultural traditions and performance contexts beyond South Asia, attending to a plurality of reception histories across time and space; she ended with a careful consideration of the political implications of the Ramayana’s narrow appropriation for the purposes of Hindu nationalism in contemporary India. Carol Robinson: Expressing Loathly Ladies—Explicitly Noncompliant. In this presentation, Carol featured the work of two of her former students who created a collaborative video adaptation of the Wife of Bath. Each student had recorded a dramatic monologue: one performance used ASL to engage with Deaf culture, relating the episode when the Wife is rendered deaf; a “political dramatization” by a queer student (in drag) incorporated contemporary debates about polygamy and marriage. Elaine Treharne: TEXT Technological Transformations: the Inexactitude of a Medieval Unreality. Elaine’s talk suggested the possibility of cross-cultural comparative analysis across seemingly disparate contexts including medieval Western and East Asian (Chinese) texts. Her reflections not only considered the rich materiality of textual production but also suggested its importance as artistic performance. These presentations richly showcased the heterogeneity of cultural/artistic/linguistic materials that we might call “medieval” (thinking expansively beyond the contours of Latin-speaking Europe). At the same time, these perspectives collectively invited us to think more creatively about what new modes of medieval appropriation and comparative analysis actually might enact and enable. Medievalism studies has certainly “arrived” in the academy and it is also clearly breaking down the boundaries between what lies within and outside of institutional and traditional academic structures. Global Chaucers is one such community among many, including other digital spaces like Medievally Speaking, and the Medieval Electronic Multimedia Organization (MEMO). We’re in a very exciting time for medievalism studies now and I hope that these networked communities will continue to thrive, grow, interconnect, and adapt. Visit In the Middle for a longer version of this posting that includes a brief discussion of an exciting new volume that may be of interest to our readers: Medievalism: Key Critical Terms, ed. Elizabeth Emery and Richard Utz (Bodyell, 2014). 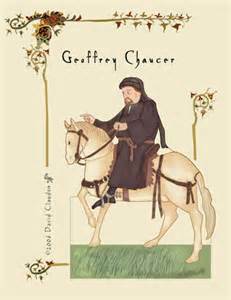 A few weeks ago, Gail Ashton (who we have featured on this blog here and here) wrote a posting about Chaucer for the Bloomsbury Literary Studies blog. Ashton’s posting entitled “What the Dickens shall we do about Chaucer?” considers the “residual” presence of Chaucer in present-day British culture, and it ends with a revealing interview about Chaucer in the schools with former Welsh poet laureate Gwyneth Lewis and former Canterbury poet laureate Patience Agbabi. 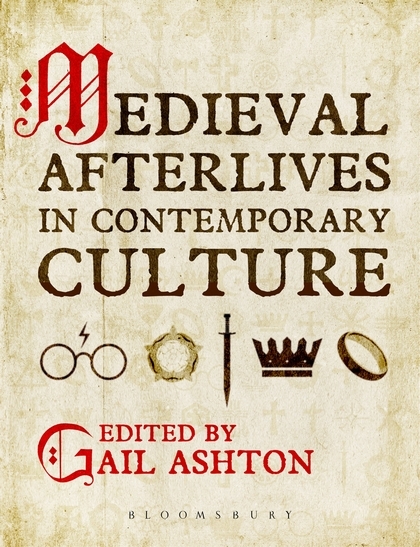 Ashton’s posting also nicely ends with a plug for her forthcoming edited collection entitled Medieval Afterlives in Contemporary Culture (Bloomsbury, forthcoming 2015). Candace Barrington and I have a co-authored article entitled “Global Chaucers” in that collection–so stay tuned! 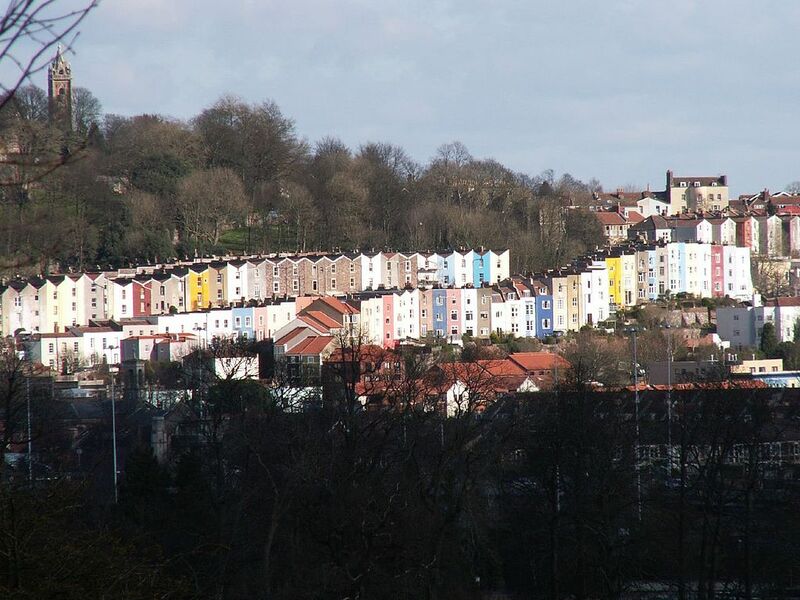 Check out Edson Burton’s radio comedy, De Wife of Bristol, on BBC Radio 4! Available for only a short time. Paper doll Chaucer goes from counting his beads to riding his horse. My article, “Traveling Chaucer: Comparative Translation and Cosmopolitan Humanism,” presents a theorized methodology for how we approach the highly collaborative process of studying non-Anglophone translations of Chaucer’s The Canterbury Tales. Equally important, this article effectively demonstrates the highly collaborative nature of the Global Chaucers project. In addition to the usual panoply of readers and auditors providing advice and reactions that writing any article entails, “Traveling Chaucer” depended upon extensive help from Nazmi Ağil (Chaucer’s Turkish translator) and Leyla Zidani-Eroglu (a colleague fluent in Turkish). Without their good will and expertise, the article would have been impossible. Furthermore, without similar good will and expertise from other translators and readers, the entire project would flounder. Thank you for all who have supported this project! You can read the article here. Please remember that this is an electronic version of an article published in Educational Theory. Complete citation information for the final version of the paper, as published in the print edition of Educational Theory, is available on the Blackwell Synergy online delivery service, accessible via the journal’s website at http://www.blackwellpublishing.com/edth or http://www.blackwell-synergy.com.